Smell: Sweet & Sour, often tropical and/or fruity with hints of the famous "cheese" smell. Potency: Strong highly euphoric head effects & hard-hitting body stone effect, combined with an extremely flavorful and pleasant smoke make this a great candidate for the connoisseur grower. Blue Cheese by Big Buddha seeds is a stablized (indica-leaning) F1 Hybrid bred from the original U.K. Cheese (mother) and a specially selected Blueberry (father). The smell of the buds are often fruity, sweet and sometimes sour or spicy or with hints of the famous “cheese” smell. In fact the incredibly strong smell of the buds in flowering may be overwhelming. Very popular strain that is gaining a lot of attention lately. Powerful and stoney effect has been described as "euphoric". 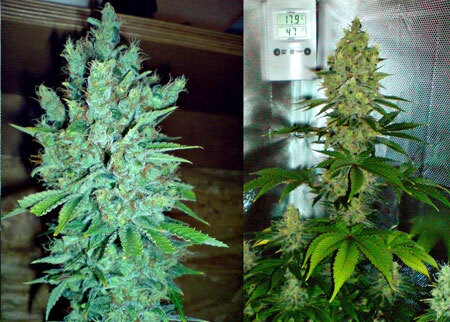 Forgiving and ultra easy to grow indoors with pretty good yields. Naturally mold-resistant (which is partly why this strain is popular in humid climates like the UK). This strain is not as good for growing outdoors with stealth because the powerful smell gives it away. Most plants grow short and stocky with lots of side branching, though certain plants tend to grow a bit taller. Responds very well to plant training. Needs about 8-10 weeks in the flowering stage to allow her to fatten up properly and produce her signature stinky potent buds. Get your seeds from a trusted source! Submit your own Blue Cheese pics and strain review here!